senior citizen recipes. healthy senior citizen recipes. Ageing does manifest with time and we all age gradually over the years. As we pass 60 years, our body undergoes certain changes which includes structural and hormonal both. What more naturally comes with it is also slow metabolism, a drop in appetite, decreased digestive health and oral problems along with a few common health problems like hypertension, heart disease, diabetes and osteoporosis (especially in women) by some. It becomes important for them to concentrate on their health to avoid chronic diseases in near future. Nutrient dense meals which are easy to chew and swallow as well as easy to digest should be the main focus of their diet..
2) Stay hydrated by consuming at least 2 litres of water each day. Dehydration causes dizziness, tiredness and constipation. 3) Boost your power with proteins. Dals and pulses cooked with minimal fat and khichdi is one of the healthy vegan pick. Eggs for vegetarians is a good option. Some good dal options are methi toovar dal recipe and palak chana dal recipe. 4) Do not miss out on that crucial calcium consumption daily is a must especially for women with osteoporosis. Include dairy products like curds, paneer, butter milk along with a ragi flour, broccoli and greens. For those who are obese, can try low fat dairy products. Try our high calcium recipes like Date and Apple Shake and Rajasthani Pakoda Kadhi. 5) Swap refined foods like maida and semolina with healthy whole grains like jowar, oats, quinoa, barley and bajra. 6) Munch on nuts and oilseeds which are rich in Omega 3 fats such as walnuts, almonds, flaxseeds etc. Try some healthy options like Walnut Sheera, Flaxseeds Dry Chutney or homemade almond butter recipe. 7) Shun that extra spice from the meal. It can irritate the gut. 8) Fun up your daily meals with fresh herbs like mint leaves, coriander, parsley etc. This will help to make meals pleasing and increase appetite. 9) Dodge out from shopping salty and processed foods such as packaged soups, ready to fry foods such as French fries, tikkis, etc. as they contain high sodium content and can increase risk for hypertension and cardiovascular diseases. 10) Restrict the consumption of fried foods and sweets to not more than a fortnight in limited quantities. 12) Find a fitness friend and exercise daily for at least 45 minutes. Weight training is crucial right through your life as it will strenghten the body and prevent those easy bone breaks which happen later in life. Run, Brisk walking or yoga can be done. Exercise becomes even more important as with increased age, metabolism slows down and less calories are burnt. 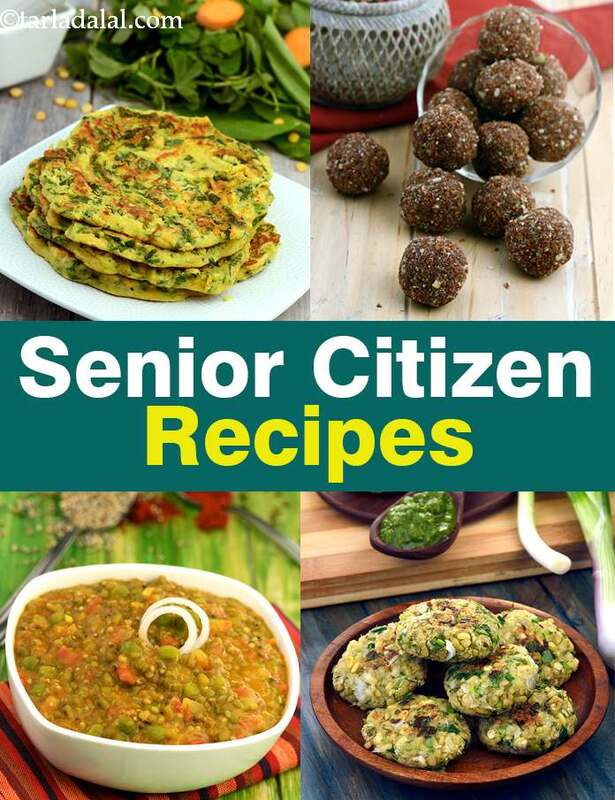 Enjoy our senior citizen recipes. healthy senior citizen recipes and other senior citizen articles below.